Recycle Utah has bins for your next party! Great for conferences, concerts, weddings, family reunions, fundraisers and every other gathering you can imagine. More people doesn’t have to mean more waste! 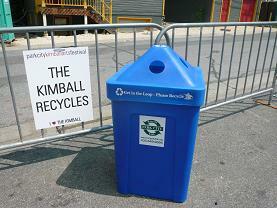 Make sure you have recycling bins for your next shindig and you’re on your way to a zero-waste event. Call ahead or stop by to reserve your bins. Pick up the bins on the scheduled day and pay a $25 depost. Rental fees for bins are $3/bin per day. Return with bins full of recyclables the next day, empty the bins in the proper places, and leave the empty bins with an RU employee. Our sturdy bins are clearly labeled Recycle, however it’s up to you to indicate what you want in each bin. The more clearly labeled, the smoother the recycling process will be. We have a few types of bins available and we will help you best determine what you need for your event. For a list of what items Recycle Utah – Park City accepts, please visit our Acceptable Materials page here.